Traditionally each module leader on the Conservation provision had set up his/her own module Blackboard site. This had the effect that equivalent content was in different locations on different sites and caused considerable confusion for the students. The problem was exacerbated by the fact the many teaching staff did not have access to Blackboard sites other than the ones they were teaching on which provided limited opportunity for exchange of best practice. Sarah Ruston (AQD) helped design and share a common template for all Forestry and Conservation Blackboard sites to standardise the look and the navigation. 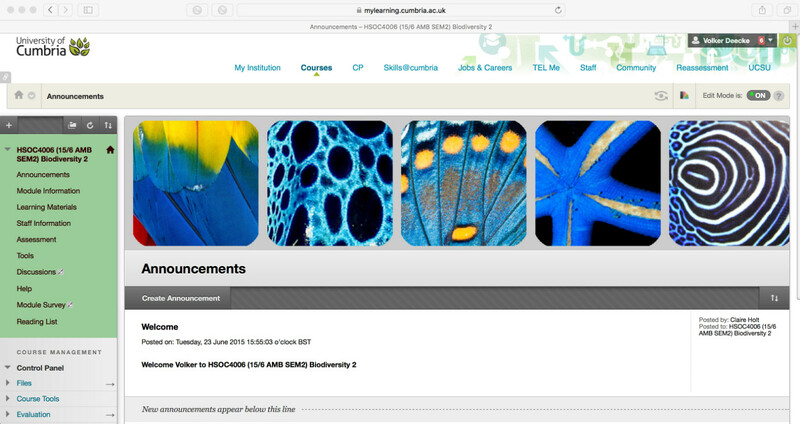 The template provided an effective way to standardise the layout of the module Blackboard sites while at the same time enabling module tutors to customise their sites (e.g., by including custom banners and colour schemes). The latter was important so as to avoid students (and staff) getting confused as to which Blackboard site they were accessing at any given point. Student feedback about the standardisation was very positive and the new layouts were welcomed at the staff-student forums. The exercise also had the benefit that now course leaders and external examiners were now automatically enrolled on the relevant module Blackboard sites. This entry was posted in Case Studies and tagged Blackboard, Blackboard Customisation, Volker Deecke.